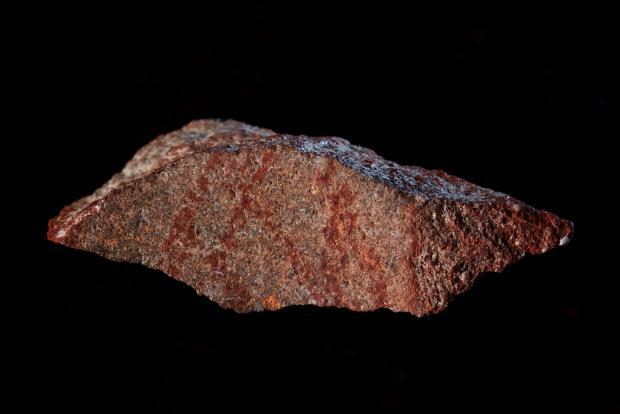 A small stone flake marked with intersecting lines of red ochre pigment some 73,000 years ago that was found in a cave on South Africa's southern coast represents what archaeologists on Wednesday called the oldest-known example of human drawing. The abstract design, vaguely resembling a hashtag, was drawn by hunter-gatherers who periodically dwelled in Blombos Cave overlooking the Indian Ocean, roughly 300 km east of Cape Town, the researchers said. It predates the previous oldest-known drawings by at least 30,000 years. While the design appears rudimentary, the fact that it was sketched so long ago is significant, suggesting the existence of modern cognitive abilities in our species, Homo sapiens, during a time known as the Middle Stone Age, the researchers said. The cross-hatched design drawn with ochre, a pigment used by our species dating back at least 285,000 years ago, consists of a set of six straight lines crossed by three slightly curved lines. The coarse-grained stone flake measures about 38.6 mm long and 12.8 mm wide. "The abrupt termination of all lines on the fragment edges indicates that the pattern originally extended over a larger surface. The pattern was probably more complex and structured in its entirety than in this truncated form," said archaeologist Christopher Henshilwood of the University of Bergen in Norway and the University of the Witwatersrand in South Africa, who led the research published in the journal Nature. "We would be hesitant to call it art. It is definitely an abstract design and it almost certainly had some meaning to the maker and probably formed a part of the common symbolic system understood by other people in this group," Henshilwood added. Other Blombos Cave artifacts of similar age included ochre pieces engraved with abstract patterns resembling the one drawn on the stone as well as ochre-covered shell beads. 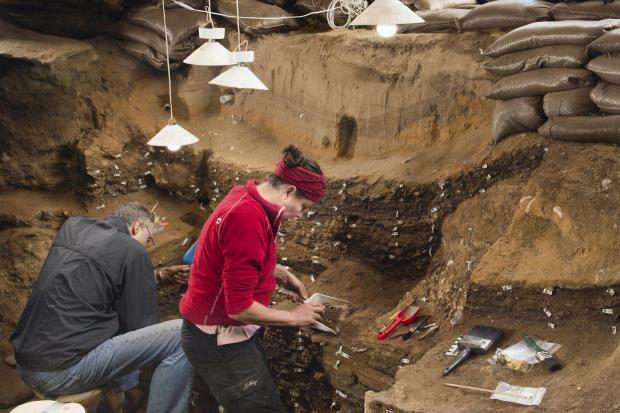 Blombos Cave artifacts dating from 100,000 years ago included a red ochre-based paint. "All these findings demonstrate that early Homo sapiens in the southern Cape used different techniques to produce similar signs on different media," Henshilwood said. "This observation supports the hypothesis that these signs were symbolic in nature and represented an inherent aspect of the advanced cognitive abilities these early African Homo sapiens, the ancestors of all of us today." Homo sapiens first appeared more than 315,000 years ago in Africa, later trekking to other parts of the world.